GCU will give full-tuition scholarships to the first of 100 inner-city students as part of its Students Inspiring Students program. The first of 100 students from high schools in Phoenix and Glendale will receive the surprise of a lifetime when Grand Canyon University awards them with full-tuition scholarships at a special ceremony at 6 p.m. Nov. 7 at GCU’s west Phoenix campus. The scholarships are part of a groundbreaking program designed to increase educational opportunities for students with limited financial means. Now in its third year, Students Inspiring Students is a collaboration among GCU, the Grand Canyon University Scholarship Foundation, local high schools, and business and philanthropic leaders to improve K-12 education. Each year, the university awards 100 full-tuition scholarships to students from inner-city high schools who meet academic criteria, demonstrate financial need, and received 100 or more hours of tutoring at GCU’s Learning Lounge, a free after-school tutoring program designed to improve the skills and confidence of underperforming students and boost achievement for those taking advanced-level classes. The university will surprise the first 25 SIS scholarship recipients on Nov. 7. An additional 25 scholarships will be awarded in January, followed by the balance of 50 more in the spring. The average GPA of the first 25 SIS scholarship recipients, who come from nine different high schools, is 4.1. 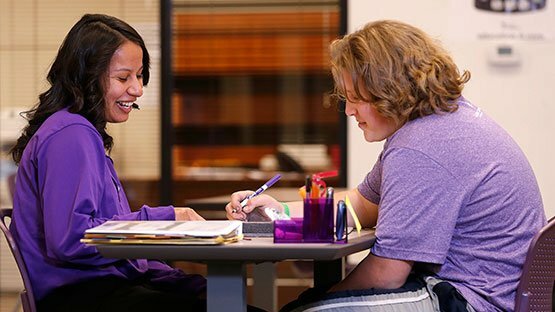 In addition to high academic achievement, the recipients also must receive strong recommendations from GCU’s Learning Lounge LEADs (Learning Advocates… or tutors). When SIS scholarship winners enter GCU next fall, they will pay it forward as university students by providing 100 hours per year of mentoring and academic support at a Learning Lounge site to assist the next group of high school students behind them. “At its core, this program is all about students helping students and the impact it can have at inner-city schools in our state,” added Veres. Students Inspiring Students is a grass-roots, self-funded initiative that is sustainable, scalable, and provides a real solution to academic challenges at schools in low-income areas, according to Brian Mueller, GCU’s president. The Students Inspiring Students initiative is an expansion of GCU’s five-year-old Learning Lounge program that started with nearby Alhambra High School, which has achieved remarkable results. Alhambra High, located in a diverse neighborhood of refugees from around the world, is a school where more than 40 languages are spoken and more than 90 percent of students fall below the federal poverty level. When the Learning Lounge opened, Alhambra was rated a D-rated school by the Arizona Department of Education based on its students’ showing on the Arizona Instrument to Measure Standards (AIMS). Just two years later, Alhambra was nine points away from being a B school. Earlier this year, Alhambra was recognized as a Gold School, the highest level of achievement awarded by the Future of Arizona’s Beat the Odds Institute, recognizing Alhambra’s consistent academic achievement over the past several years. The Students Inspiring Students full-tuition scholarships are made possible by a fundraising campaign between the Grand Canyon University Scholarship Foundation – which is a 501(c)(3) nonprofit — and local business and philanthropic leaders. The university matches all Students Inspiring Students donations to the Foundation. The goal is to raise enough money to expand the program and award 800 full-tuition scholarships (200 per year) to qualified high school seniors while creating an education-minded inner-city community with students who are passionate, motivated and capable of succeeding in college and the workplace. The initiative requires no government help or intervention, and no tax increase. It’s an opportunity for business and philanthropic leaders to partner with inner-city schools, give back to their community and make a significant impact on education in Arizona. “K-12 schools in this neighborhood are assets, not liabilities. And the kids in those schools are assets, not problems to be solved,” Mueller said. “By investing in them, the trajectory of the entire neighborhood will change.